These slow cooker navy beans are flavored with a combination of ketchup, brown sugar, and molasses, along with chopped onion and seasonings. It's a very easy recipe to make in the slow cooker, and they go well with pulled pork barbecue, hot dogs, or chops. The beans are soaked overnight. You could also use the quick-soak method described on the package of beans. If you have difficulty with beans in your slow cooker, it could be the acidic ingredients or salt, or it could be the hardness of the water or age of the beans. To avoid tough beans, simmer them on the stovetop in water until they're just tender and then drain them and add them to the slow cooker with the remaining ingredients. Cover and cook on low for an hour or two. 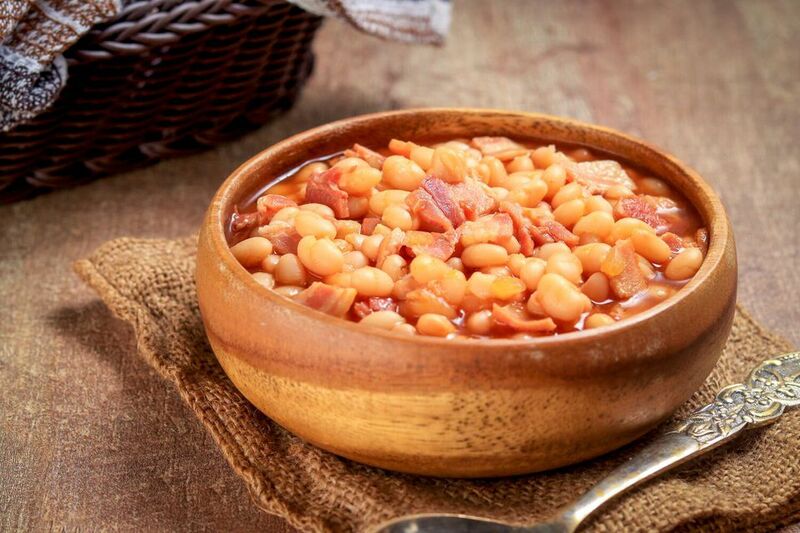 Drain the soaked beans and put them in the slow cooker with the salt pork or bacon, the onion, and 8 cups of water. Cover and cook on LOW for about 5 to 6 hours, or until tender. In a bowl, combine the ketchup, brown sugar, molasses, mustard, and salt. Pour over the beans and stir to blend and continue cooking on LOW for 1 to 2 hours. Serve the beans with coleslaw and cornbread, if desired. When soaking beans, it is important to use a container that is large enough. Dry beans expand to 2 or 3 times their volume when rehydrated, so they will need much more space than is immediately apparent. To soak your beans, cover your cleaned dry beans with abundant water (3 or 4 cups of water per cup of beans). Allow them to soak for at least 8 hours, preferably overnight, then drain and rinse them before cooking. If you live at an altitude of 1,000 meters (about 3,300 feet) over sea level, your beans will take a little more soaking time to rehydrate that they will at sea level.